The New York International Numismatic Convention (NYINC) is traditionally held sometime during the first few weeks of the year. Taking place for many years at the Waldorf-Astoria in downtown Manhattan, the show has now moved down the block to the Grand Hyatt for the first time, where it will be held from January 12th to the 14th. In conjunction with the show, a large number of auctions are being held, ranging from numismatic books to world paper money. In this preview article, we will take a look at a few of the highlights from one of those auctions, the Heritage Auction. In particular, we will be examining the Platinum Night session, which will be offering some of the rarest items that week. All lots discussed in this article, as well as all other lots offered by Heritage during the week, can be found on their website. We’ll start with an ancient coin of Alexander III, also known as Alexander the Great, offered as lot 32018. 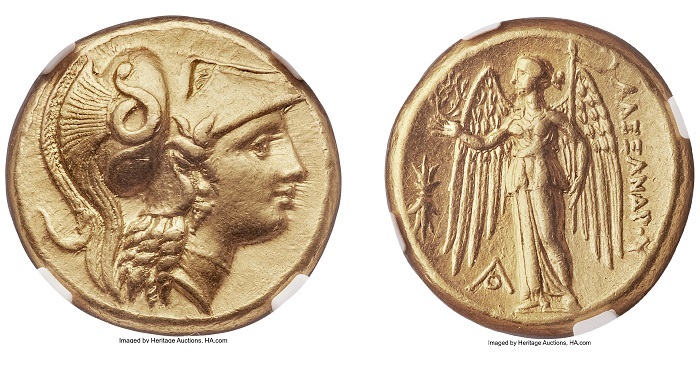 This distater was issued during his lifetime and struck at Amphipolis in Greece. While silver coins of Alexander the Great are not particularly rare, as the issues were struck over a huge area for many years after his death, gold issues are a different story. These are much more scarce and seldom come up for auction, particularly not in nice condition, such as the NGC Certified AU (strike 5/5 and surface 5/5) offered by Heritage. Amphipolis was a large city in what is now Greece (many remnants of it can still be seen to this day) and was also the place where Alexander the Great prepared for his battles in Asia. The coin shares many similarities with the silver issues of this era but is notably different on the reverse, which features a standing Nike, the goddess of speed, strength, and victory. The next coin we’ll take a look at is something completely different. Lot 32160 is a PR-63 Cameo certified example of a 1915 20-pesos from Cuba. Hard to believe today, but this coin actually has a strong American connection. It was designed by Charles E. Barber and struck at the Philadelphia Mint at a time when Cuban-American relations were much better than they have been in recent history. An extremely rare coin in Proof format, it is estimated that less than 50 pieces were struck, but modern numismatic researchers have failed to come up with more than a few dozen individual examples that are known to exist today (and that number might even be grossly exaggerated). 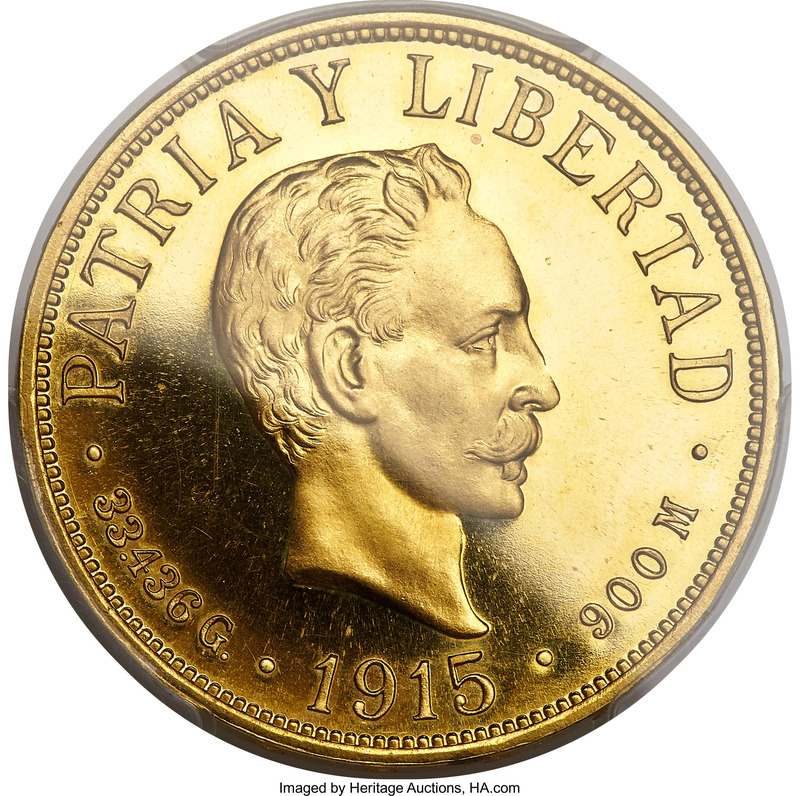 The obverse features a portrait of Cuban national hero José Martí, while the reverse features the national coat of arms. 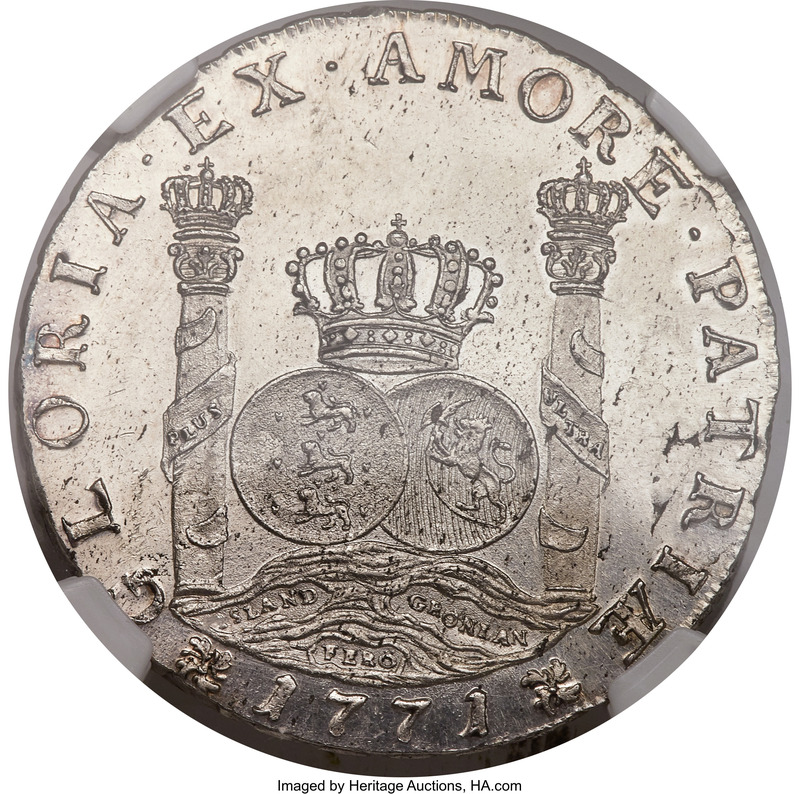 The Spanish Colonial Pillar 8 Reales was a very popular trade coin in the 18th century, especially in Asia, where they circulated on a large scale. Lot 32170 features a related, yet different coin — a Danish 1771 Trade Piastre struck in 1774 for the Danish Asiatic Company. Graded MS-63, the design is very similar to the Pillar Dollar with a few notable differences. The texts are different, while the globes on the obverse feature the arms of Denmark and Norway. Below them is a mound with the names of three islands. The reverse, instead of the Spanish coat of arms, features the crowned arms of Denmark, Norway, and Sweden. A coin related to early globalization, examples are extremely rare in all grades, and an Uncirculated example is almost unheard of. We move back in time again with lot 32241, a very rare gold penny of 20-pence struck in London under the British Monarch Henry III, graded MS-63. 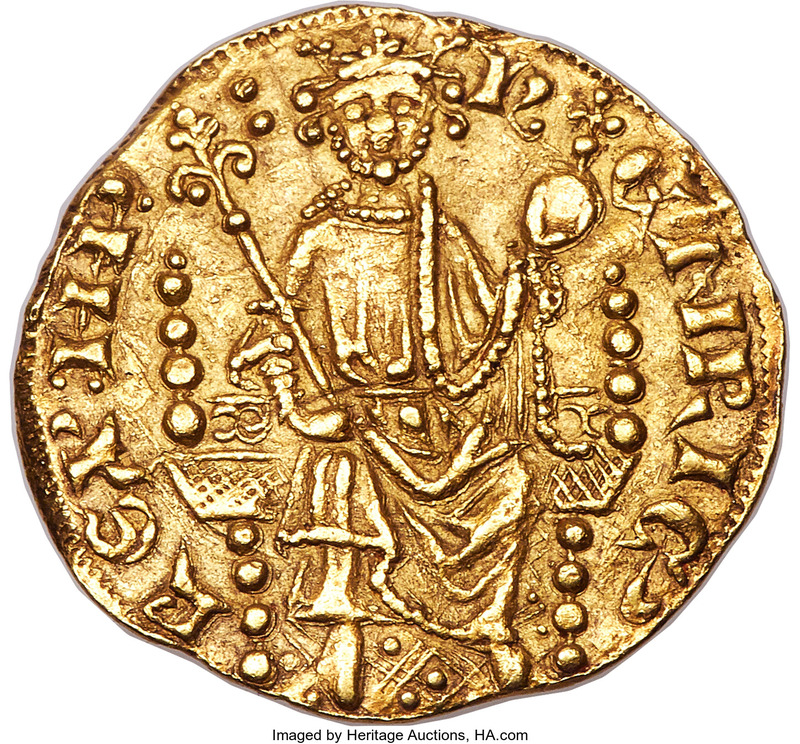 A cross between Byzantine gold coins (in circulation in England at the time) and English silver pennies at the time, this is regarded as the very first gold coin struck of the British kings. The auction description lists only seven known examples of this rarity, with most of those permanently impounded in museums, including the British Museum. Circulation of this issue must have been limited, as most appear to have been melted or lost, accounting for the great rarity of this issue. The issuance of this coin was ordered directly by Henry III himself at twice the weight of a silver penny and valued at 20-pence, making it one of the highlights in British numismatics and a coin of great historical significance. Platinum has been known to mankind for many thousands of years, but it has really only been in the last few hundred years that this rare, hard metal has found widespread usage. Today it is mostly used in vehicle emission control devices, jewelry, and has also become a popular investment. The United States Mint has produced platinum eagles for several decades now, but it is by far not the first use of this rare metal in coinage. Among the early experiments using platinum for coinage is a group of Russian coins produced from the late 1820s until the mid-1840s, and lot 32477 is one of those pieces. 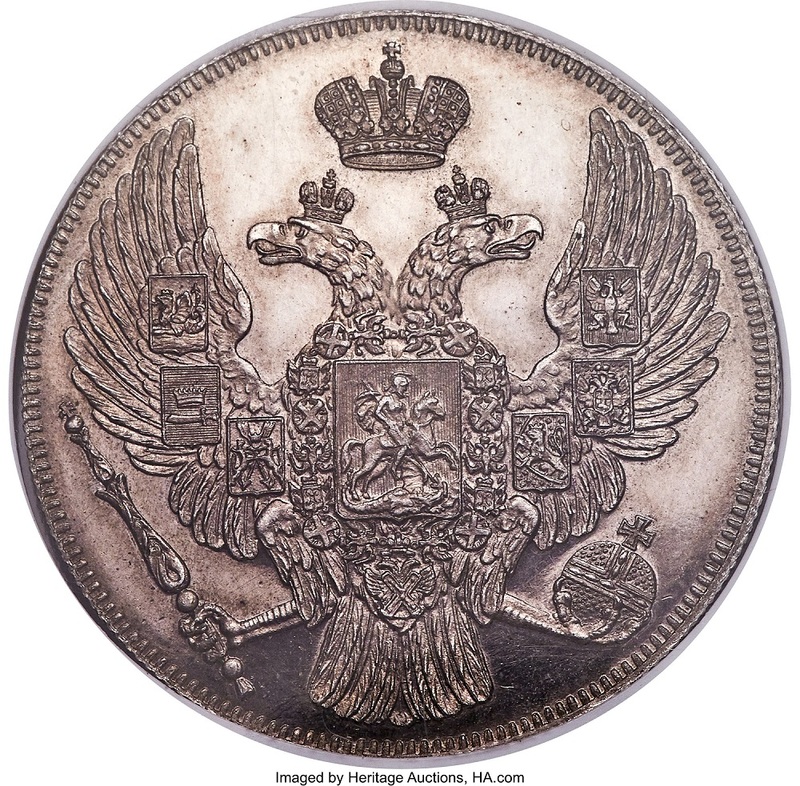 This particular example was struck in 1833 at the St. Petersburg Mint under Nicholas I, a 12-rubles piece that is one of the finest known examples of this rare series, graded MS-64PL. Being the largest denomination of platinum coinage in the series, survivors are extremely rare in all grades, as they were exchanged in large quantities for gold coins after the platinum price had dropped on the world market in the mid-1840s. Despite attempts to revive platinum coinage, Russia would not strike platinum coins again until the 1970s and only as commemorative coins sold to collectors at a premium over bullion value.